Artist's impression of the Schiaparelli module with thrusters firing. 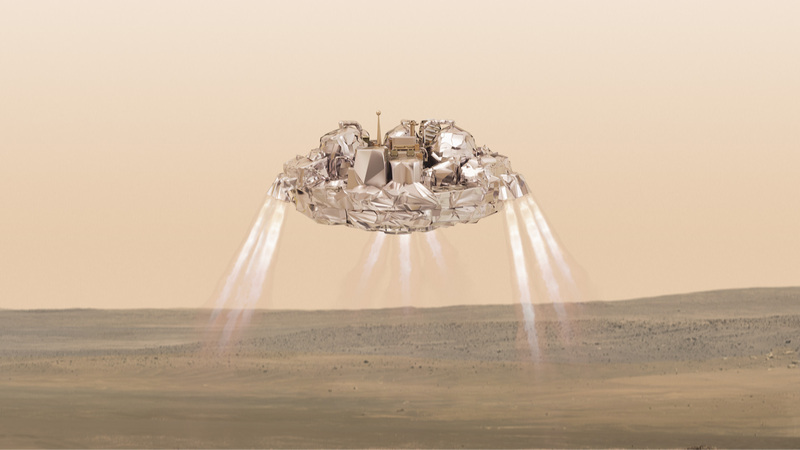 On 19 October, Schiaparelli will enter the Martian atmosphere at an altitude of about 121 km and a speed of nearly 21 000 km/h. Less than six minutes later it will have landed on Mars. A braking system, made of 3 clusters of 3 thrusters, will be used for the final deceleration phase, slowing the module from a speed of about 250 km/h at an altitude of 1.1 km to 4 km/h at 2m. At that stage the thrusters will cut out and the module will fall freely to the surface with the impact force being absorbed by a crushable structure on the underside of the lander. Once on the surface, a small meteorological station (DREAMS) will operate for a few days. DREAMS will measure local weather conditions at the landing site, such as temperature, humidity, pressure, dust opacity, wind speed, and wind direction. It will also perform measurements of the electrical properties of the Martian atmosphere, the first time this has ever been done. Further details of the entry, descent and landing sequence can be found here.